One of the fields of active research related with climate change is CO2 storage. Some new findings are promising as read here. These technologies have the advantage that they can work on-site in the CO2 heavy production works and do not introduce the carbon in low mines. 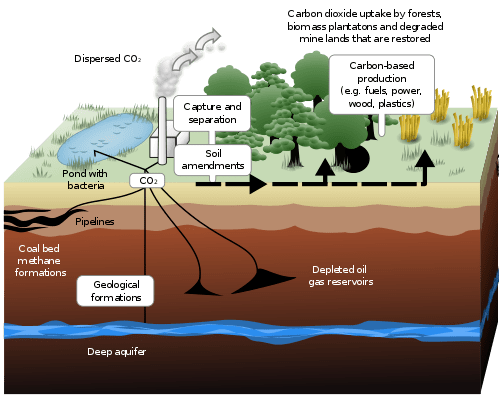 Theoretically we could even close the carbon cycle, burn a fossil fuel, capture carbon, make another fuel, burnt It again,… The only problem is that it doesn’t seem possible to get so much efficiency, and even in that hypothetical case a good filtering of particles needed for public health combined with carbon capture could lead to a cost increment that could make solar energy really cheap in comparison. Because the great thing of fossil fuels is that they store a lot of energy in the chemical bindings among carbons, it doesn’t seem easy to bind them again without expending even a higher energy again. Anyway, I have not reliable data about those hypotheses. It would be really great although really unlikely to enjoy the advantages of fossil fuels without altering our climate. We do not have to close any door because the problem is complex and there is no magic solution. Nevertheless, sooner or later we will have think in some alternative to fossil fuels because as they are not renewable they will end someday. So maybe climate change is not only a great risk, it can be also the opportunity to begin this way.